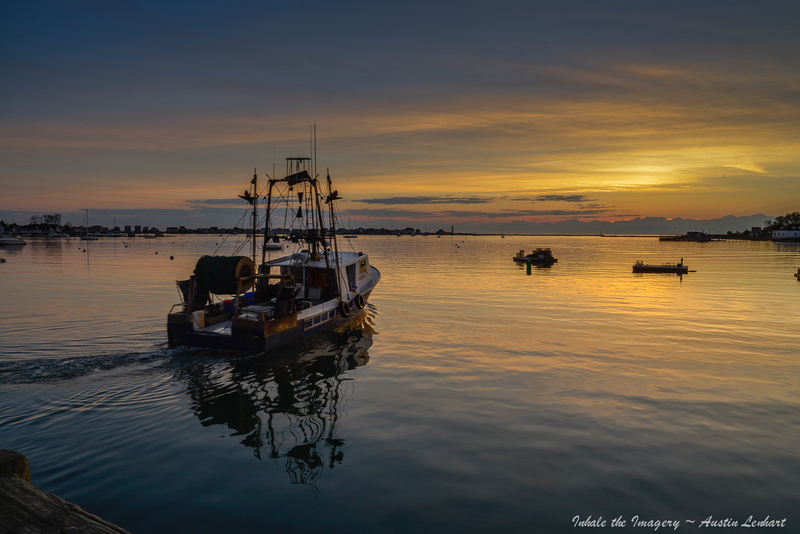 Up at 4:30 am to watch a Scituate sunrise.. Decided to head over to our small town harbor and see who was setting sail; Parked the car on the commercial fisherman’s dock.. A truck was already there. A man in his teens sits inside drinking coffee…waiting for someone…. Soon another truck pulls in. One advertising a Landscaping Co. on its side doors. I think to myself, “Two jobs…Its Sunday, they’re making ends meet, It’s their way of life…being a fisherman and all; Salt of the earth”… It always brings me back to the thought of the American Cowboy; You know, that open-range tradition that can only be found at the nearest tourist-dude-ranch…the gut sinks a little; then my thought wonders to Ed Abbey and his book, “Lonely are the Brave”; a great story of loss.. The beginning of the end of the Cowboy way by modern barbed wire fence that we call interstate and the progress of corporate doings and regulation… I turn focus back; He gets out; not much older than the other; He must be the captain. They both head to the boat, they nod to me but other than that they are on task, a silent one. Engine starts; a quick prep begins….they soon slip from dock, heading to ocean wide….heading to open range.